Everyone enjoys a home-cooked meal. But whether you are preparing a feast or re-warming last night’s leftovers, it’s important to take some basic precautions to avoid turning a quiet meal into a devastating house fire. Keep cooking areas free of combustible materials, such as potholders, packaging, and paper towels. Don’t wear loose clothing that can dangle onto a burner and catch fire. Don’t leave food unattended while it cooks. 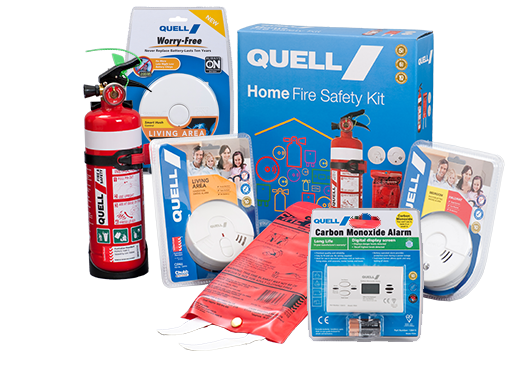 Keep a kitchen fire extinguisher, such as Quell’s 1 kg unit, suitable for cooking fat/oil fires inside of a kitchen cabinet and a 1 metre x 1 metre fire blanket. Read the instructions and know how to use your extinguisher and fire blanket before a fire breaks out. Check the pressure gauge on your extinguisher monthly to ensure it is charged and ready to use. Fire blankets may be used to extinguish small cooking fires and clothing fires. 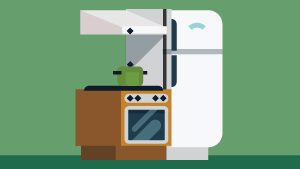 Keep children and pets away from cooking areas by creating a one metre “safe zone” around the stove. And don’t forget to call 000 in the event of a kitchen fire, even if you have extinguished the flames.